Adventure weddings, extreme weddings, weddings gone wild…call it whatever you like, but if you have an idea for a non-traditional, extraordinary, unique wedding then we’re the company for you! We LOVE adventure and would be thrilled to help you out with whatever adventurous idea you may have. What exactly is an adventure wedding? Really it’s whatever you want it to be. Typically an adventure wedding involves a recreational activity in the outdoors. Think heli-skiing, whitewater rafting, dogsledding, or maybe horseback riding. Maybe you’d like to say your vows on a mountain bike trail or after a triathlon? Of course, you’ll want to choose an activity that is best suited to you. Whatever your desire, we’ll help make it happen. There are several ways to go about having an adventure wedding. One way is for only the couple and their witnesses to be involved in the adventurous activity and later meet up with friends and family at the reception. Another way is to provide an activity that everyone can partake in. 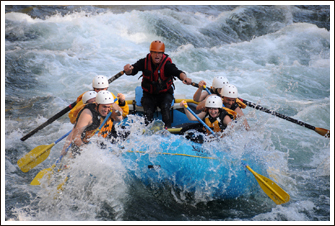 Take for example a rafting adventure. The actual ceremony may take place by the shores of a river. Several rafts could transport the bride and groom, and their more adventurous guests down the river to the ceremony site, while other guests walk in. Or, maybe the wedding takes place in traditional fashion and only the bride and groom are swept down the river in a raft after the ceremony. Whether your adventure wedding takes place in the Canadian Rocky Mountains or elsewhere, Naturally Chic can help with all the arrangements. We’ll help with all the usual wedding arrangements as well as help with obtaining permits, arranging transportation, recommending videographers and guides, and any other task necessary to make your dream a reality.